Along with the atrium transformation that was designed to improve the circulation through the store, Marshall Field's completed an interior remodel of the first basement up to the 7th floor. We started at the bottom and worked our way up. One of the biggest challenges was dealing with the age of the building. Piecing it together in sections over the years covered a multitude of sins, and stripping the floors from wall-to-wall exposed where the building had not been updated or maintained over the years. Under the wood floors, the cinders and cement were broken up, requiring extra floor preparation. Some features, like the 8th floor Walnut Room and Tiffany glass ceiling at the south rotunda (Wabash side), were still in excellent condition. But throughout the rest of the store, all new finishes were added. Gutting the floors back to the studs, we painted, added new marble aisles and walkways, and restored significant features, like the plaster columns. Additional measures had to be taken to ensure sound construction when mixing the old with the new. For example, when we added a new stairwell, a metallurgist had to ensure the welds were compatible with the old steel, and engineers had to check the bolts that we used. As the space was reconfigured over the years, some of the plaster columns had been cut or damaged. To restore the existing columns, we removed one column that was not supporting the structure and created a mold so missing and damaged pieces could be made. Those pieces were wrapped around the steel and set together. Once in place, the plasterer smoothed and removed the seams. The historic gold filigree that topped each column couldn't be covered. A special ceiling was designed to accommodate the lighting. The other major challenge was keeping the store open during the renovation. Swing space was created to temporarily relocate merchandise as we renovated one floor at a time – about 100,000 square feet on each floor. Signage and barricades directed patrons away from construction and where they needed to go. Until one day. As we were wrapping up work on the 6th floor and six months away from finishing the entire restoration, we were presented with an unexpected emergency. 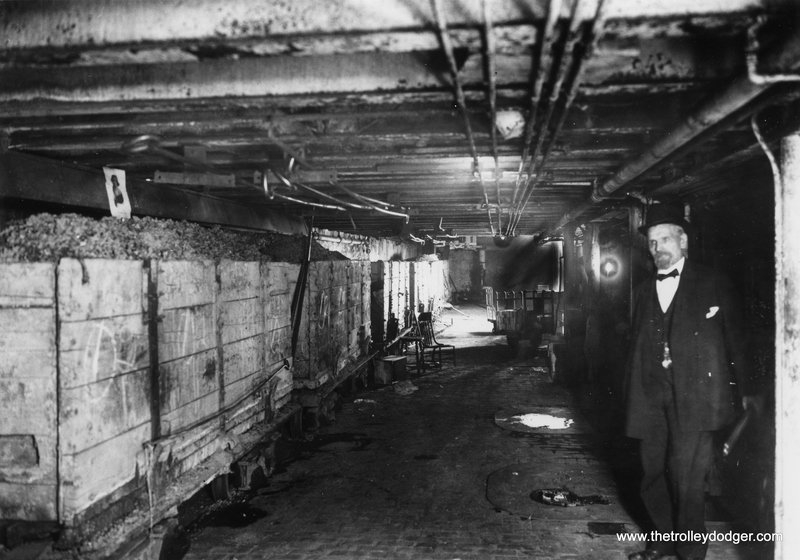 At the turn of the century, Chicago’s bustling loop was serviced by an underground narrow-gauge rail tunnel. Trains lumbered underneath the busy city, delivering coal and removing garbage from the high-rise buildings, terminating at the Chicago River where they would load and reload. As means and methods evolved, the tunnels were abandoned and left to quietly sit under the city. Until the spring of 1992, that is, when rehabilitation work on the Kinzie Street Bridge crossing the Chicago River required repairs. Crews unknowingly caused pressure that cracked the wall, creating a small mud leak and eventually flooding the tunnel with more than 250 million gallons of water and silt contaminated from decades of use, including residue from the Great Chicago Fire. Once again, one of Chicago’s greatest icons faced destruction. The massive store has three underground basements, and water started seeping into the lower levels. The highest-level basement was a sales area. The second and third levels were full of inventory, storage and mechanical space. As the lower levels began to fill, our biggest concern turned to the merchandise and sales space in the first basement. No one in the city was clear about what was happening. Pepper started investigating the origin of the water so we could determine if it would destroy the 1st basement. Knowing that water would eventually seek its own level we figured it could possibly rise to the same level as the Chicago River. We set up a benchmark down by the Chicago Theatre and from our calculations determined the water would stop two feet below the ceiling of the second basement, which meant the first basement would be spared. A day and a half later we sighed in relief – we were right! The scene looking west on the Kinzie Street Bridge where workers inadvertently punctured a century-old freight tunnel, causing massive basement flooding in dozens of buildings in Chicago's downtown area. -- Tribune photo by Charles Cherney, April 13, 1992. The flood had done its damage. Water completely filled the bottom two basements. Operations came to a halt. The electrical system was blown. Product was destroyed. The cafeteria, offices, the boilers and the support for every mechanical – all were under water for two to three weeks. And all were destroyed. The electrical system was ravaged. Looking down the stairs to the 2nd and 3rd basements below, the water glowed from the electricity surging through it from the electrical vaults in the 3rd basement. We worked with ComEd to shut off the electricity, so we could go down and begin the massive cleanup and restoration process. Marshall Field's employee Cathy Hoffman looks down into the water of the flooded third basement at the downtown State Street store. -- Tribune photo by Chris Walker, April 16, 1992. To release the elevators that were stuck below water level, we sent scuba divers down. The Pepper team pumped the water out, brought in temporary electrical service and cleared the bottom two basements of contaminated debris and sediment from the rivers. The men wore hazmat suits and protective masks to stay safe. Our Pepper team worked tirelessly to make Marshall Field’s operational again. In addition to barricading off the affected areas, we used ComEd vaults on the roof, and generator trucks lined Randolph street to restore enough electricity to power some lighting, some elevators and cash registers. The store was shuttered for no more than two and a half days. Once the chemist agreed the basement was clean, we began working around the clock, rebuilding everything - repairing the systems, tearing everything apart, drying it out, rebuilding and replacing it. One by one, systems came back on line: the boilers, HVAC system, elevators, steam, compressed air and lighting. As we brought them back on line, the store also recovered day by day. Marshall Field’s used to make its own candy, and the refrigeration system for the candy was in the 3rd basement. In addition to repairing the systems, Pepper faced an incredible cleanup effort. Marshall Field’s used to make its own candy, and the refrigeration system for the candy was in the 3rd basement. Imagine: 30-yard long dumpsters full of chocolate being hauled away to a dump site. Apparel, house wares and all the product stored in the basement - all discarded because it was contaminated. Luxury goods that were once prized had to be handled with kid gloves to ensure none of the systems or people were endangered. The store defied expectations by partially reopening just one week later.